Reverse: GENL. OF THE AMERICAN ARMIES RESIGND. THE COMMD. 1783: / ELECD. PRESIDENT OF THE UNITED STATES 1789 + / RESIGNED THE PRESIDENCY 1796 + [in the center, on a scroll] REPUB. / AMERI. Comments: Listed by Fuld as WA.1800.1 and by Dalton and Hamer as, Addenda, Middlesex, no. 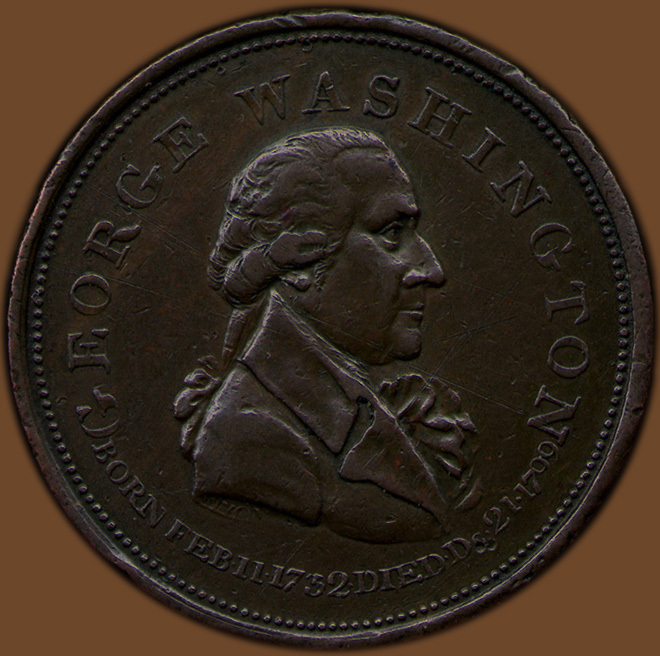 245 Bis on p. 542 as part of the Middlesex, Penny section, Washington series (Dalton and Hamer illustrate this coin but give an incomplete obverse legend and only list a white metal variety!). 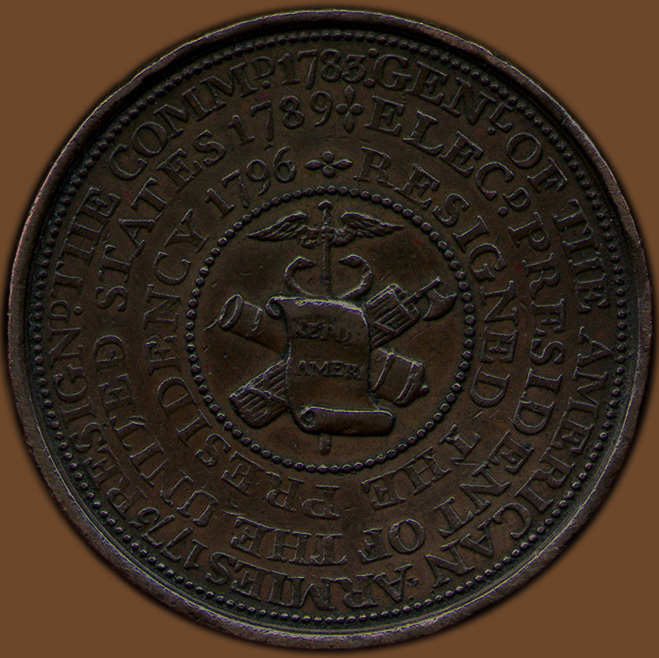 Thomas Wyon's 1796 dies were reused for this token. His signature WYON appears at the arm truncation on the bust click here for a detail and for a highlighted detail click here. 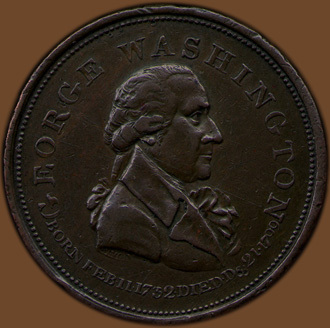 As Washington died at the end of 1799 it is most probable the token was minted in 1800. 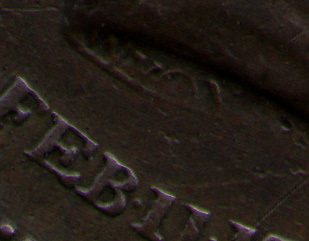 The obverse date area of Wyon's original die was recut. The area below the bust originally had the date 1796, this was removed and replaced by Washington's birth and death dates (from BORN...1799) using smaller letter punches than had been used on the original legend. 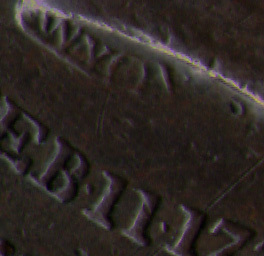 In this area the numeral 3 in the date 1732 was originally punched into the die as a 5 that was then transformed into a 3. Washington's birth date is given as February 11 which is from the old style calendar, the date based on the new style Gregorian calendar (which had been adopted by Britain in 1752) is February 22nd. Also, the actual date of Washington's death was December 14th not the 21st. For a description of the imagery on the reverse of this token see the introduction to this section. Provenance: Acquired through the Robert H. Gore, Jr. Numismatic Endowment from EANA auction of November 16, 1996, lot 111.